The Flat i-Cord is an amazing thing. First of all, it’s so simple to knit; think two i-cord edges without the middle. I also love that you can knit it on straight needles without sliding the working stitches to the other end time and time (and time) again. No DPNs required here. And yes, it is flat. Take a look at how looks from the side. Above is a headband and the 3-color version to the right is a scarf both are part of the original announcement. If this is your first time reading about the Flat i-Cord you’ll want to read the original post 5 Reasons Why You’ll Love Our New Flat i-Cord. The idea for knotting was influenced by my visit to Old Mystic which is one of my favorite little historic towns. Mystic is an old maritime port and so there are lots of boats and lots of knots. I love to drive by the old Colonial homes with the dates and names of the original owners on them. Our first house was in Stamford, CT. It was built in 1760’s as part of Fort Stamford. My husband and I renovated that house every weekend for three years. Now that our son goes to college in New London, Connecticut I get to visit the area on a regular basis and really enjoy it. There’s a cute yarn shop there as well. While I’m finishing up the sweater pattern let’s get started with some technique tutorials. The summer shell uses the Flat i-Cord as a strap made from 2 i-cords. Here it is knit with two colors for the tutorial. There is a free photo tutorial download (shown below) that shows you how to work the knot. I’ve updated the original Flat i-Cord tutorial, added button holes, fix it information if you drop the stitches off the needle and the knotting instructions. I quickly knit up a small cowl that will be used as a tutorial for yet another (and very exciting) way to use the Showy Decrease. It’s impossible for me to decide which application of the Showy Decrease I like best, this new one or the Showy Garter projects. That’s a good sign, don’t you think? Thanks to everyone who brought the Granite Lake Shawl in the Ravelry top 5 for days. 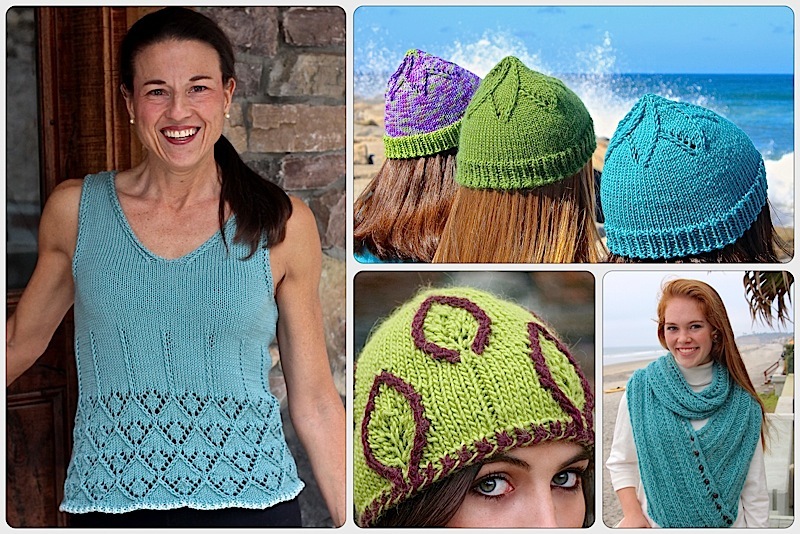 The originally published patterns with tutorial is on Ravelry. The Dubhlinn Summer Shell with this knotted strap is now published. This tutorial available at link above. This entry was posted on July 19, 2017 by Laura Cunitz in Flat i-Cord, Free Downloads, Nuances.